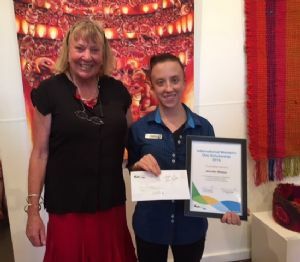 Jenny Walker of Bega has won the Bega Valley Shire Council’s Young Women’s Scholarship, part of the Shire’s International Women’s Day (IWD) celebrations. Hers was one seven applications considered by Councillors at their 24 February meeting. Ms Walker, 23, has been an active member of the Bega Branch of St Johns Ambulance for eight years and has aspired to become a paramedic for as long as she can remember. She is presently working part-time and has committed to her lifelong dream to become a paramedic. She has faced some trials along the way, as she has a minor learning disability and has been rejected three times as a cadet by NSW Ambulance Service. Ms Walker aims to undertake a Certificate IV qualification which will lead into a Bachelor of Paramedical Studies. She recently raised more than $2000 for the Flight Care helicopter by fundraising around the local Bega community. In five years she wants to be a fully qualified paramedic servicing the local Bega community and she hopes that in 10 years she will have advanced to being a paramedic with some managerial responsibilities. Her $500 scholarship will go towards easing the financial burden her plan will incur. She also wants to become an ambassador for future women in the Bega community who wish to undertake studies. Jenny was presented with her scholarship on Friday by Deputy Mayor, Liz Seckold at the opening of Spiral Gallery's International Women’s Day exhibition. IWD is a significant day of recognition and celebration of the economic, political and social achievements of women and the Young Women’s Scholarship recognises the important contributions young women make in our community. The scholarship is awarded to a local woman aged 18 to 25 years who has shown potential in her field of endeavour, whether it is business, music, community, arts or sport. The IWD Young Women’s Scholarship is an important opportunity to showcase the meaningful contributions of young women to local communities. Photograph: IWD Scholarship winner, Jenny Walker.